Delegations from Russia, Iran, Democratic Korea, Pakistan, Canada and the US, Venezuela, Brazil and Bolivia have been observing the presidential election process at polling stations in various provinces. 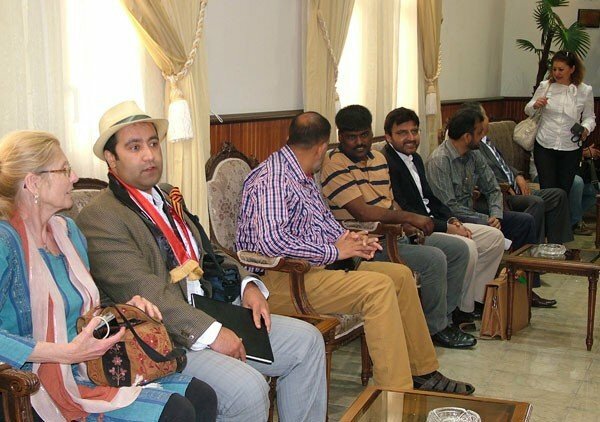 The visiting delegations, who have come at Syria’s invitation, included parliamentary, political, media, cultural and civil society figures, in addition to peace advocates and independent activists. The delegation members went to Damascus, Lattakia, Tartous, Aleppo and Sweida and Homs. Member of the Russian Federation Council Igor Morozov said the presidential elections in Syria are witnessing a high turnout and marked by absolute transparency and integrity. He added that whole families have been streaming to polling stations and standing in long lines. Morozov noted that many “international observers” are in Syria to oversee how the election process is running. “We all have full freedom to meet citizens and political movements’ representatives, and we don’t feel any hurdles being put in our way,” he said, hailing the pluralistic basis on which Syria’s elections are taking place. Beside local support, he added, President al-Assad also enjoys foreign support as felt by the Russian mission’s members, particularly in Beirut, before arriving in Damascus. A geopolitical researcher from the US, in Lattakia, stressed that what she saw in Syria is “contrary” to the impressions she had on the situation in the country. Bolivian Parliament Speaker Marcelo Elio Chavez told SANA reporter, upon visiting a number of voting centers in Sweida, said the Bolivian delegation came to take a close look at the elections in Syria and attest to its integrity. “We came to express our solidarity and support for the democratic process in Syria…and to congratulate the Syrian people over this key event,” he said, adding that the elections reflect the values of democracy, transparency and freedom of the Syrian people. Also in Sweida, Venezuela’s Ambassador to Syria Imad Saab hailed the atmosphere within which the electoral process is going on in the province as reflecting optimism of the participants. Millions of people around the world, including in Venezuela, support the Syrian people and stress solidarity with them, Saab added. President of the World Peace Council Socorro Gomes of Brazil, said she came to Syria as a representative of peace-lovers and the Brazilian people who voice their love and solidarity with the Syrian people in this important event. She added that the Syrian presidential vote reflects respect of the constitution and Syria’s right to self-determination and rejecting foreign intervention. In Aleppo, Iranian MP Amir Khojasteh and other Iranian figures toured several polling stations along with Governor Mohamamd Wahid Aqqad. A delegation of independent activists and peace advocates from several countries have made tours at balloting stations in the city and countryside of Homs since the presidential voting started early this morning. Governor of Homs Talal al-Barazi said in a statement to SANA reporter that the delegation members showed desire to visit a number of voting centers to oversee the election process across Homs. “There were free to choose whatever centers they wanted to visit,” said al-Barazi, adding that the delegation were accompanied by a number of MPs.